Our Corporate Partners share our vision of a healthy ocean for marine mammals and humans alike. Oracle employees take part in a Corporate Volunteer Day at The Marine Mammal Center. Corporate support directly impacts the heart of our mission: to advance global ocean conservation through marine mammal rescue and rehabilitation, scientific research, and education. Through critical corporate investments, we inspire action to protect the oceans by sharing audiences and broadening a collective community that is passionate about ocean health. Together, we can inspire a new generation of ocean ambassadors. How can corporate partners help? Corporate Partnerships at The Marine Mammal Center are designed to be mutually beneficial and impactful to our shared goals for ocean conservation and a healthy environment for future generations. Partnerships are customized but do have a minimum cash contribution requirement of $50,000. Corporate Sponsorships of individual programs or events have a minimum contribution starting at $5,000 with different benefits than Corporate Partnerships and do not include Corporate Volunteer Days or co-branding. 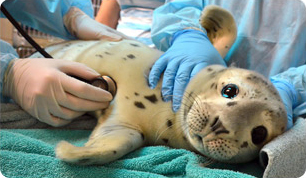 If you are interested in building a dynamic and impactful partnership with The Marine Mammal Center, please complete the form below and we will contact you soon! Yes, I would like to talk to someone about becoming a Corporate Partner of The Marine Mammal Center. Yes, I would like to talk to someone about program or event sponsorship opportunities.